Develop language and story sequencing skills. Students use the software to sequence pictures. Great for ESL students! Use these resources with children or adults. Bilingual special education products and resources are in demand to help students from minority language backgrounds who have disabilities affecting their ability to learn in the classroom. When bilingual students experience difficulties in the classroom, it is often a challenge to determine why they are failing. Problems resulting from limited experience using English, cultural differences, or lack of educational opportunities are common but should not be viewed as evidence of a disorder. These students can learn efficiently if provided with culturally and linguistically appropriate programs of instruction. Instructional programs are most effective if teachers make use children's previously acquired knowledge and experiences. If a communication disorder or learning disability is identified, opportunities for instruction in the home language can facilitate learning and help children to develop cognitive strategies that will transfer to English. It is important to provide students with comprehensible input. Each child has different experiences. Some children come from homes where Spanish is used all of the time. Others come from home where English is the predominant language used by one or more members of the family. In many cases, the best approach is to provide opportunities for instruction in both the home and school languages. Instruction in the home language helps students to develop cognitive strategies that will facilitate learning and make it easier for them to learn English as a second language. 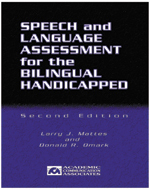 Bilingual special educations products and assessment materials are described below that can be helpful in developing effective learning programs for special needs students who are learning English as a second language. A variety of practical resources for speech-language pathologists and special education teachers are available in the ACA bookstore. (Published 2008) -This book, written by Dr. Celeste Roseberry-McKibbin includes detailed information about cultural differences and issues relevant to assessment and intervention with students from bilingual backgrounds. Practical strategies are included for use in meeting the needs of students from diverse backgrounds. 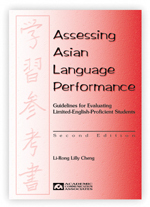 No other book provides more information about issues relevant to the speech and language assessment of students from Asian language backgrounds. 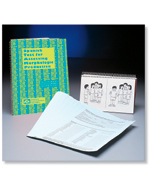 The book includes information about many of the Asian languages and dialects. Cultural factors that influence performance are also discussed. 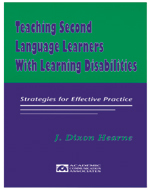 This book includes practical strategies for meeting the needs of special learners from bilingual/multicultural backgrounds. Information about bilingualism and cultural differences is presented that special educators need to consider in educational program planning. 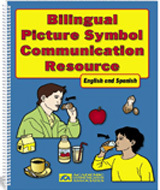 This popular book focuses specifically on issues relevant to the identification of bilingual students with communication disorders. 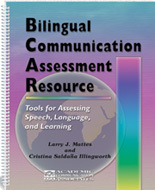 The book includes a comprehensive review of the literature and practical strategies for conducting assessments. This criterion-referenced inventory includes a variety of informal tasks for assessing production of phonemes and use of phonological processes.This instrument is used by speech-language pathologists in the identification of students with articulation/phonology disorders. 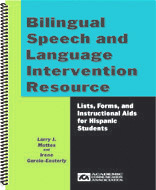 This comprehensive resource includes activities and reference lists that can be used to develop instructional activities for Spanish-speaking students with language disorders and learning disabilities. 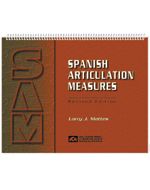 This instrument includes short criterion-referenced tasks for assessing both articulation and language skills. Labeling items, describing noun functions, making comparisons, giving explanations, and solving problems are among the skills assessed. Both the structural and functional aspects of communication are examined. 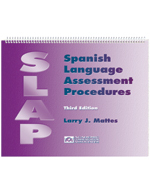 Assess use of verb tenses, plurals, and other grammatical morphemes using the STAMP. Grammatical morphemes are assessed as students respond to questions and complete sentences related to the content of pictures.